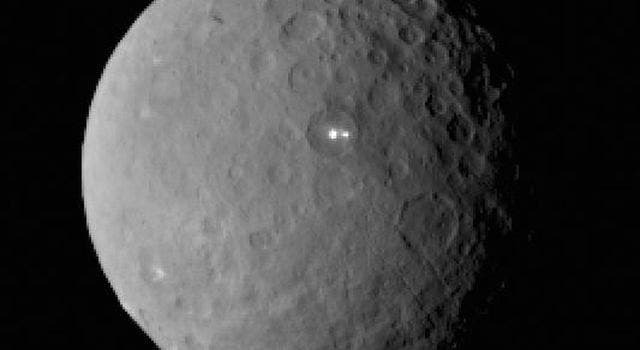 The closer we get to Ceres, the more intriguing the distant dwarf planet becomes. New images of Ceres from NASA's Dawn spacecraft provide more clues about its mysterious bright spots, and also reveal a pyramid-shaped peak towering over a relatively flat landscape. "The surface of Ceres has revealed many interesting and unique features. For example, icy moons in the outer solar system have craters with central pits, but on Ceres central pits in large craters are much more common. These and other features will allow us to understand the inner structure of Ceres that we cannot sense directly," said Carol Raymond, deputy principal investigator for the Dawn mission, based at NASA's Jet Propulsion Laboratory in Pasadena, California. Dawn's visible and infrared mapping spectrometer allows scientists to identify specific minerals present on Ceres by looking at how light is reflected. Each mineral reflects the range of visible and infrared-light wavelengths in a unique way, and this signature helps scientists determine the components of Ceres. So, as the spacecraft continues to send back more images and data, scientists will learn more about the mystery bright spots. In addition to the bright spots, the latest images also show a mountain with steep slopes protruding from a relatively smooth area of the dwarf planet's surface. The structure rises about 3 miles (5 kilometers) above the surface. Ceres also has numerous craters of varying sizes, many of which have central peaks. There is ample evidence of past activity on the surface, including flows, landslides and collapsed structures. It seems that Ceres shows more remnants of activity than the protoplanet Vesta, which Dawn studied intensively for 14 months in 2011 and 2012. Dawn is the first mission to visit a dwarf planet, and the first to orbit two distinct targets in our solar system. It arrived at Ceres, the largest object in the main asteroid belt between Mars and Jupiter, on March 6, 2015. Dawn will remain in its current altitude until June 30, continuing to take images and spectra of Ceres in orbits of about three days each. It then will move into its next orbit at an altitude of 900 miles (1,450 kilometers), arriving in early August.